A SPATE of searing temperatures that sapped moisture levels and crop potential across much of eastern Australia in the second half of September sent records tumbling in many areas, according to analysis by the Bureau of Meteorology. 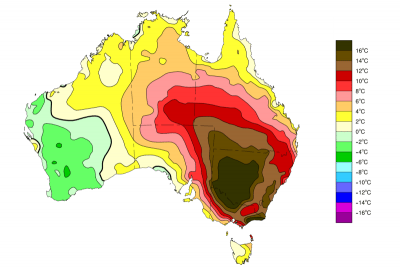 On 22 September, Australia as a whole had its warmest September day since national area-averaged temperature records began in 1911. In the following week, New South Wales and Queensland had their warmest September days on record, and South Australia, Victoria and the Northern Territory each had days in their top-10 warmest for September. More than 20 per cent of Australia by area recorded its hottest September day on record during 22–29 September. From 20 September, a high pressure system centred over NSW kept much of eastern and northern Australia mostly cloud free, despite some frontal cloud crossing the southern coastline. 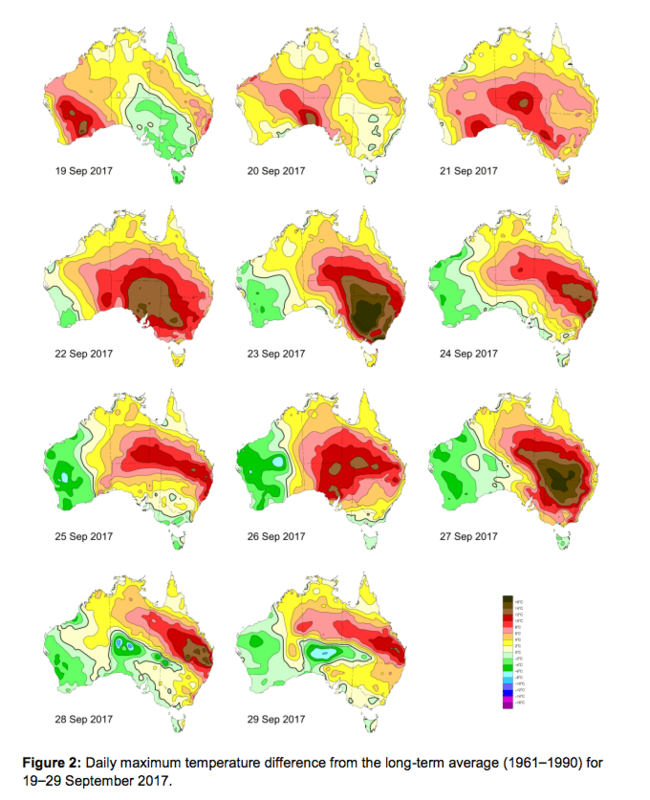 With very low rainfall during most of the month, and below-average soil moisture, the sunny days quickly led to rapid heating of the land surface and overlying air in Central Australia, Queensland, and much of NSW. By the 22nd, the high pressure system was located over the northern Tasman Sea, with an associated weak ridge over the southeast maintaining generally clear skies. The high became slow moving and remained over the Tasman, while a complex low pressure system tracked across the south of the Great Australian Bight, during the 23rd. On the 23rd, maximum temperatures were more than 16 degrees warmer than average in some parts of the country. Warm air was drawn along a vigorous surface trough extending from central and northern Australia into southern and eastern parts of the country. Hot, dry northerly winds ahead of the trough and cold front contributed to NSW, southern Queensland, and areas in neighbouring States experiencing unprecedented hot weather for this time of the year. As the cold front crossed the southeast of the country overnight on the 23rd to 24th, a cool change moderated temperatures, although persistent north-easterly flow along the trough saw conditions remain very much warmer than average in northeast NSW and southern Queensland on the 24th. A new high pressure system crossed the southeast into the Tasman Sea during the 26th and 27th, with northerly winds and exceptionally high temperatures again returning to much of Queensland, the east of the Northern Territory, and northern NSW. Australia as a whole had its warmest September day on record on the 22nd. On the 23rd, New South Wales had its overall warmest September day on record. In NSW on the 23rd, seven sites broke the State’s previous high temperature record for September, with Wilcannia’s 40.5 °C the hottest in the State and the first time a temperature of 40 degrees or more had been observed in NSW in September. This record was surpassed four days later when a temperature of 41.4 °C was observed at Wanaaring on the 27th. During this week, almost 70pc of NSW by area had its hottest September day on record. On the 23rd, the warmth also extended south into Victoria with Mildura recording 37.7 °C—a new Victorian high-temperature record for September. By the 27th, the heat was concentrated further north and Queensland as a whole experienced its warmest September day on record. Birdsville reached 42.8 °C on the 27th, setting a new Queensland record for the hottest September temperature in the State—beating the previous Queensland record of 42.4 °C at the same site on 22 September, 2003. From the 23rd to the 29th, 31 ACORN-SAT locations (out of 62 locations that make up the Bureau’s high quality, long-term temperature dataset across mainland eastern Australia) had recorded their hottest September day on record: 18 in NSW and the ACT; five in Victoria; and eight in Queensland. There was also a record at Tennant Creek in the Northern Territory.